Spray 3- to 4-quart slow cooker with cooking spray. Mix onion, barbecue sauce, dressing and broth in slow cooker. Add beef; stir to coat. 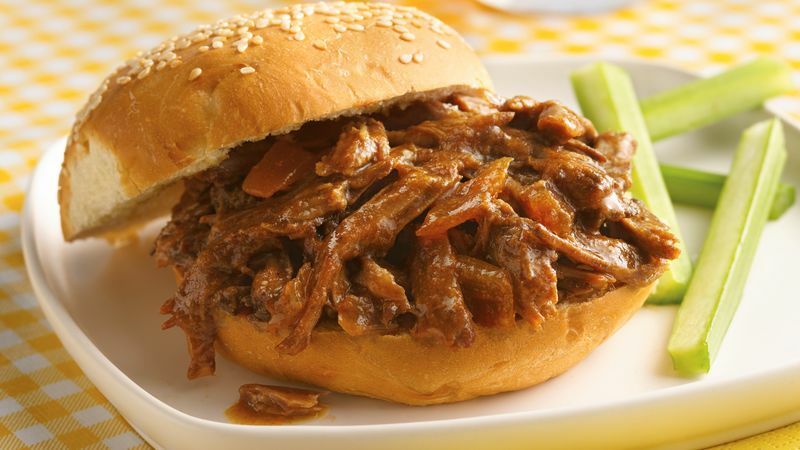 Remove beef from slow cooker; skim fat from sauce. Shred beef with 2 forks; stir beef back into sauce. Using slotted spoon, place 1/2 cup beef mixture onto bottom of each bun. Cover with tops of buns. To ensure locating a 3 1/2- to 4-lb roast, we suggest ordering it ahead of time or using 2 roasts to add up to the same weight. Trim the visible fat from the roast before cooking. Toting this sandwich filling to a gathering? Loop a large, sturdy rubber band from handle to handle across the slow cooker cover to keep it sealed during transit.